An FO, a little update and PURSES! A finished object that, someday, will become a finished object!! It is 1,042 yards of worsted weight yarn (2-ply) of my own spinning. The fiber is wool. Wool from Woolgatherers in Fond du Lac, Wisconsin. Unknown vintage or donator-sheep but I do know that the color is a sheep color, that is, undyed and I like it. Finished spinning and plying during my July 2011 staycation. Started maybe last year some time. It may become a vest in the future. I've been absent from the blog, I know. Job changes, emptying the DC apartment, the trip home from DC, having to set up another apartment in a Milwaukee 'burb, summer heat, and just not wanting or having the energy to talk/write about it all are factors contributing to my absence. DH and I are still tight--all the change-related stuff is for the job--so don't get worried about the marriage. It is very nice to be home and closer to home. And I do mean Very. An odd offshoot of all this change has been my need to change my day-to-day purse. Flying weekly and having desk drawers to stow things at work allowed me just use my back pack and a wallet or my "city" bag (actually a Lexie Barnes bag from last year (not the print pictured) - Love!) and my wallet. Now, I don't have a fixed place I go every day and I've got to--or want to--use a larger purse but the old "city" bag isn't the 'image' I want since I would like to project a more polished look due to contact with what I'll call the public. A big flowered bag just isn't working for me; unfortunately, because the interior of the bag is the best with tons of pockets and the exterior never shows wear...but I'm digressing. I'm alternating weekly between my old purses and briefcase bags to see if they'll work for me in this phase of work. One of my "old" bags (ha!) holds everything but just in a jumble-irritating. (I think there's a Freudian slip there somewhere) Do you have any favorite bags that you think I might like? Feel free to make suggestions. Please. I just finished reading Theirs Not To Reason Why: A Soldier's Duty by Jean Johnson. It was a good read and is also the beginning of a series. I believe this author is starting to write SciFi after spending time in the Romance genre. I will probably look at some of her other work; she had an interesting and enjoyable writing style. I'm enjoying the cooler weather Wisconsin has been blessed with this weekend and, as usual, doing my laundry on Sunday. I hope you all enjoy the coming week. The Bulky Hunting Beret (ravelry link) was dry this morning and here is the modeled hat. The pattern is The Country Beret (ravelry link) by Erssie Major and I used two-strands held together of Lamb's Pride Worsted in the Orange You Glad colorway. Double-pointed needles, size US 13. I didn't weigh the beret yet but I think I used about half each of two skeins. Since I adjusted for DH's large skull and my gauge, I added several stitches to the cast-on. I don't remember how many but I think I added just a few too many. Today is the last day of the regular gun deer hunting season and he is wearing it out in the woods as I type this. (Isn't he a nice DH? He likes it.) I think I'm going to try to felt this hat to give it a better fit. Some Saturday (well, technically, it is Thursday's) sky but it was so lovely I wanted to share it. Two days ago, the sky was full of colors just at sunrise. I'm glad this photo shows a few of them since the sky changed rapidly. I raced outside in my jammies (brrr) to try to capture it. Here's today's sky as seen out the window and some finished mittens. These are ladies size mittens knit from the Family Mittens (ravelry link) pattern by Lisa Akers. They took one skein (less one yard!) of Paintbox by Classic Elite Yarns. Lovely quick pattern and they've given me confidence to branch out to more mitten patterns. They are going to be a Christmas gift for someone I'm pretty sure doesn't read this blog. You might be able to see a little white stuff on the lawn in my second "sky" photo. Yes, snow on November 8th is not unheard of but still a little surprise. I wonder what other surprises are in store from Mother Nature? Mittens are a nice finished object for a day with snow. Snow on my birthday is an interesting way to start my next 50 years, don't you think? DH and I are heading north to the Farm. We'll be tromping in the woods and getting things ready for deer hunting. Then we'll sit down with my mom, cousin, aunt, and uncle for a nice birthday dinner. I'm hoping there will be some grasshopper pie! I'm looking forward to this year as a time to think about where I want my journey to take me (as much as I have any control of the steering wheel.) I have a lovely life with wonderful family and friends. So that part is perfect. Perhaps I'm having a mid-life crisis ponder about my career or occupation? Time will tell. Holiday recap and a F.O. DH and I had a very nice four-day weekend. On Friday, we both got haircuts, ate at the Indian buffet (YUM!!! ), and shopped for ceiling fans and lights for the new construction and re-construction. On Saturday, I worked out, did a few productive things, then read for the rest of the afternoon. Bliss with a book that required no brain cell bending. I love to read and will read just about anything but this was perfect for the afternoon. Sunday, the electricians showed up at a pretty early hour to start their part of the construction. Sigh. So, after a bit of breakfast and blog-reading, I took the Jeep down to Madison to do some grocery shopping and obtain things we cannot find at our local Piggly Wiggly. Once I was back home, I started a new project and completed it today. The fabric is a dark red tencel that was 20% off at Gayfeather Fabrics a few weeks ago. A simple top and a straight skirt were pretty basic to sew. I pulled out my Featherweight sewing machine and tried to remember where I put my sewing skills. *g* No formal pattern but I copied an outfit I paid quite a bit for then had one of those V-8 moments. *Hey* I can make this myself! And I did. It will look great with a black jacket or the red shawl Stacey and I plan to knit together sometime. Today I also worked on the garden and divided the Florentine Iris. For those of you who put your name in the hat earlier this summer for some rhizomes...expect a package within the next week or so. For those of you who were too shy to speak up, let me know if you are up for some iris to add to your garden. For the week's *e* recap, I visited Curves three times this week, once in Ladysmith and twice at my "home" Curves. The Spring Enticement Shawl is finished! Now, Spring can show up, any day now. *g* This isn't a fancy lace shawl but it will be fun to wear and the colors definitely make me happy. 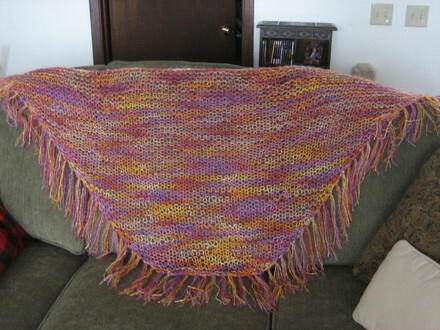 Specifics: Pattern: Famous Shawl by Fiesta Yarns. The yarn is La Boheme by Fiesta Yarns (just about 2 skeins), size US 17 circular needle and under a month to complete. This project was one of the first ones I stashed as an adult knitter. It feels nice to have it finished.